What is your guilty pleasure? Mine is ice cream. Full disclosure, I don't feel all that guilty when eating ice cream. I bask in the sweet creaminess that is ice cream. If I was ever put in the horrible situation to rid myself of all food that isn't good for me with the exception of one, I would choose ice cream every time. The flavor combinations and the variety of ways to serve ice cream are infinite. 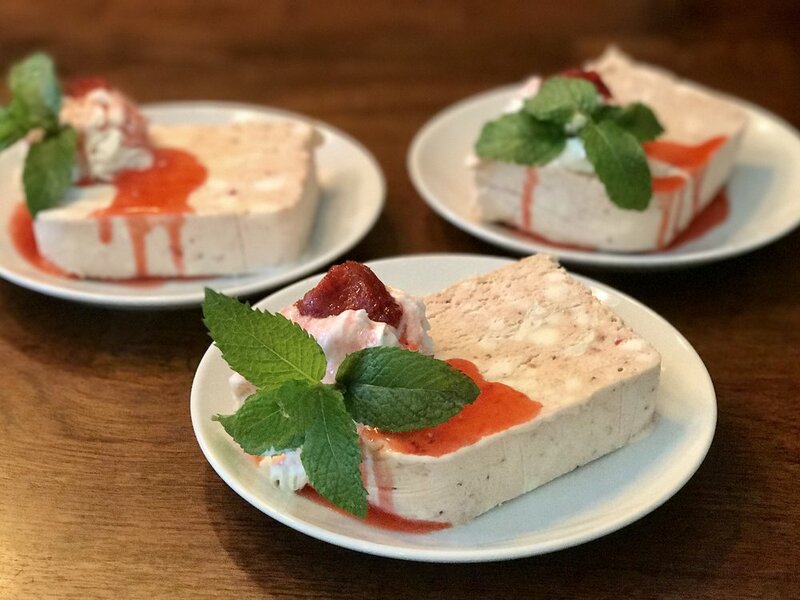 Besides driving to the store and purchasing an almost half gallon of ice cream, semifreddo is the easiest and fastest way to give into my ice cream cravings. This recipe can be made in less than an hour and be ready for eating in 8 hours. No special ice cream maker required and you can control the freshness of the ingredients used. Line a baking sheet with parchment paper. The parchment should hang over all sides of the baking sheet. You'll want to capture all those strawberry juices and have easy clean up. I purchase parchment paper from a website called webstaurant.com. The price per unit is much cheaper than the roll at the grocery store. In a large bowl, mix together the strawberries and sugar. 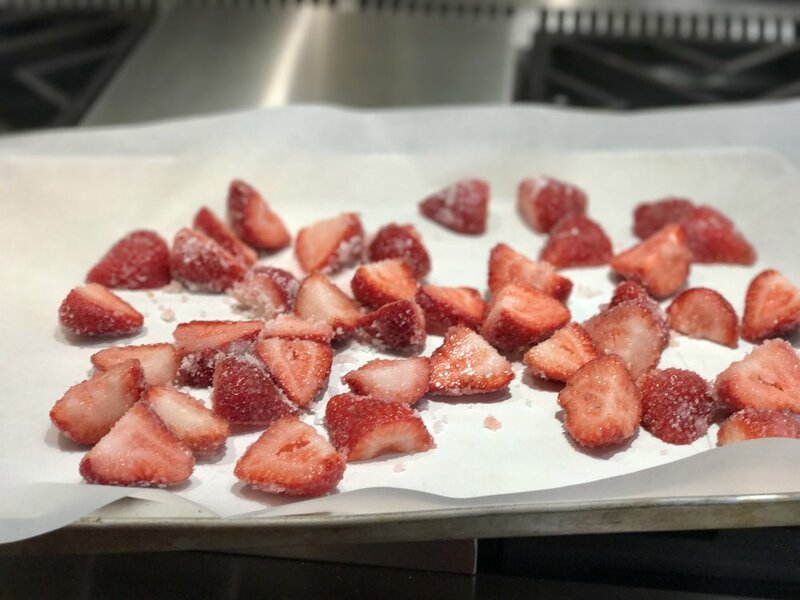 Spread the strawberries onto the parchment paper and roast for 15-20 minutes or until the strawberries are soft and have released their yummy juices . Pour the strawberries and the juices in a heat safe container. Let them cool. At this point, you can tightly seal the container and refrigerate for up to a week. This recipe will make almost 2 cups of roasted strawberries. Use the leftovers for plating the semifreddo or top a slice of multigrain toast with cream cheese, roasted strawberries and slivered almonds for breakfast. 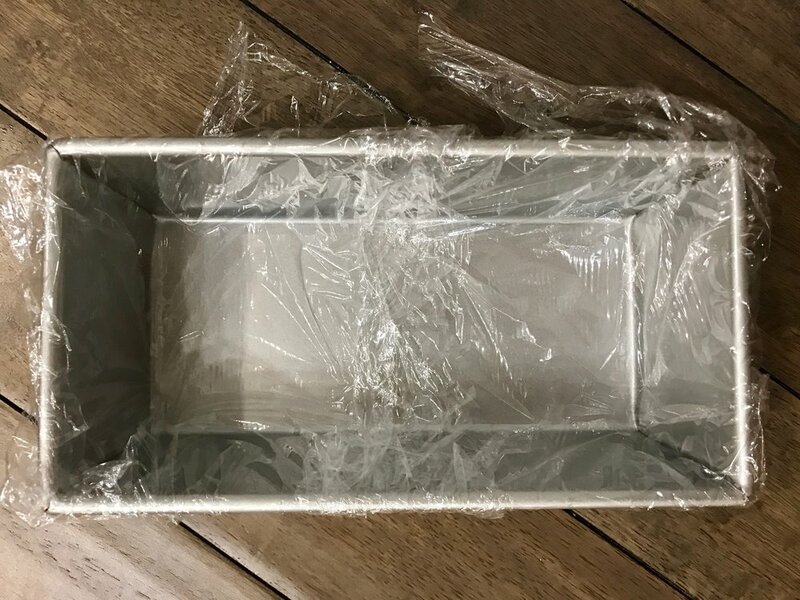 Line a 9 x 5 loaf pan with plastic wrap and set aside. Place a large bowl and the whisk attachments to a hand mixer in the freezer or refrigerator. You will whip cream a little later and whipped cream likes very cold temperatures. 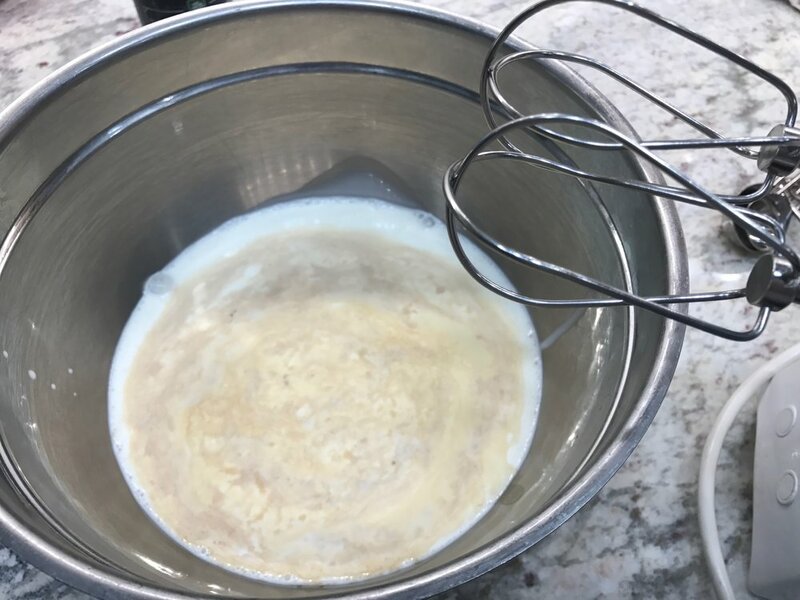 In a stand mixer with a whisk attachment, whip the eggs for about 4 minutes. 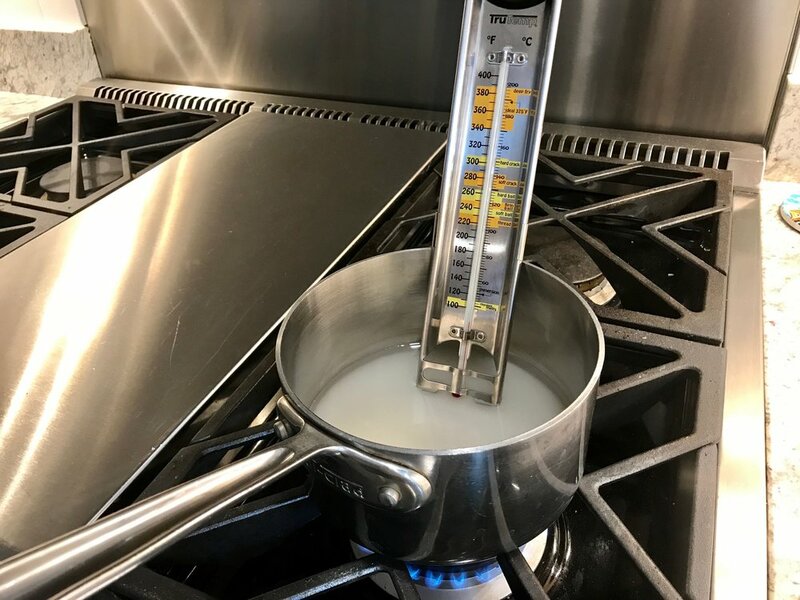 Meanwhile, in a small saucepan over high heat, bring the 1/2 cup of water, 1 cup of sugar and 1/4 teaspoon of salt to 238 degrees on a candy thermometer. Do not stir the solution. 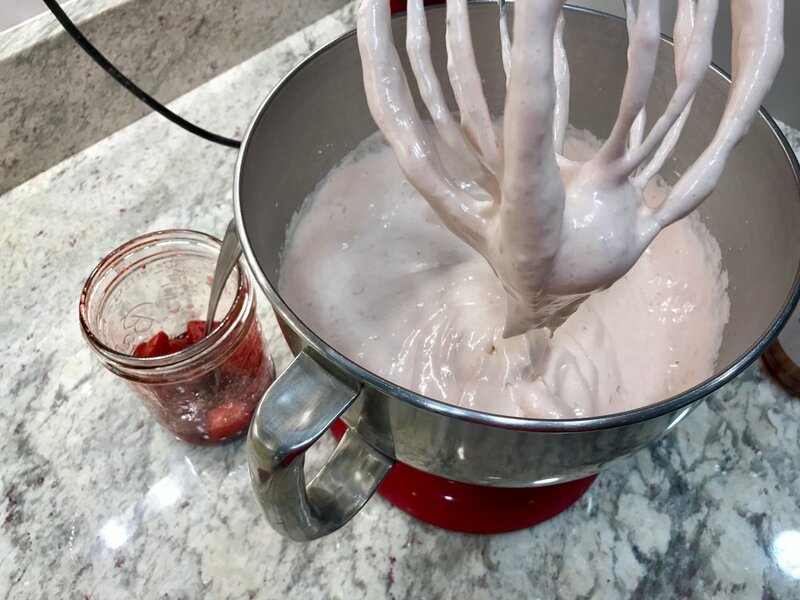 As soon as the temperature reaches 238 degrees, remove from the heat and slowly pour the sugar water down the side of the mixing bowl while the whisk is on medium speed. Don't pour the hot sugar directly into the eggs. The whisk may decide to fling hot sugar all over the place. Once all the sugar has been incorporated, add the cup of roasted strawberries and salt. Continue to whisk until the bowl is cool to the touch. Meanwhile, take out the bowl and whisk attachments you have in the freezer. Pour in the whipped cream and the vanilla extract. Whip the cream until stiff peaks form. The strawberry mixtures should be cooled by now. It's time to fold in the whipped cream. 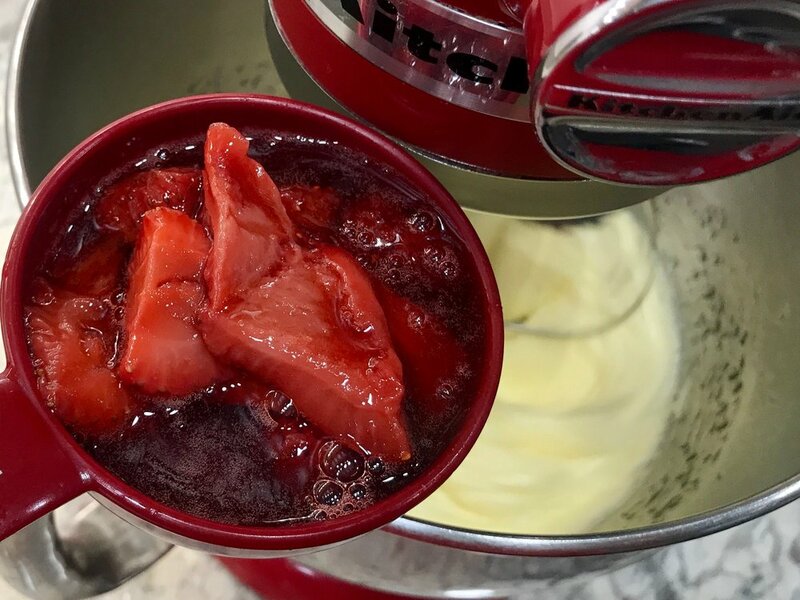 Dump in about 1/3 of the whipped cream into the strawberry custard, fold gently, then add 1/2 the remaining whipped cream. Continue this folding process until all the whipped cream has been incorporated. Melt the white chocolate over a double boiler or for 30 seconds at a time in the microwave until the chocolate is smooth. Pour 1/3 of the strawberry mixture into the bottom of the loaf pan, then drizzle the white chocolate over the top. Continue alternating layers, ending with a drizzle of the white chocolate. Cover the semifreddo with plastic wrap and then freeze for the next 8 hours or overnight. This dessert will last about a week in the freezer. Flip the loaf pan upside down on a cutting board. Remove the plastic wrap and slice into 8 pieces. Serve on a plate with a dollop of whipped cream and any reserved roasted strawberries. Garnish with a sprig of mint.